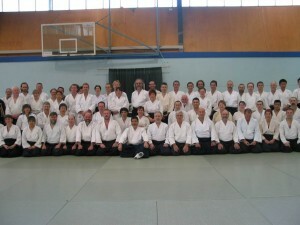 In Aikido we spend a lot of time in seiza. That’s how we sit when we are waiting for a technique to be demonstrated, and we also actually practice techniques from a kneeling position. Apparently back in the day in Japan you needed to be able to handle someone coming at you with a knife when you were innocently sitting hanging out (in seiza,) minding your own business. Unfortunately I’m not designed for kneeling. I’m all good standing. And I’m a machine when it comes to sitting – give me a chair or a couch, and I can go all day. But kneeling, not so much. And so after 30 seconds or so when my knees started to hurt a bit and I started to get a bit uncomfortable, I switched to sitting cross-legged. After a couple of years of that I decided to do an experiment. Rather than pulling out as soon as I started to get uncomfortable, I would wait until the pain got to 7 or 8 out of 10. And a strange thing happened. It took longer and longer for the pain to get to that level. Until it got to the point where it almost never did – I could sit in seiza as long as needed. I think it’s the same getting better at anything. To get comfortable with selling, I had to have conversations that weren’t comfortable to start with. To get comfortable speaking in front of groups I had to be uncomfortable to start with. If you want to get stronger you won’t do it lifting weights that are comfortable. You have to be willing to be a bit uncomfortable. I also think the idea of being willing to tolerate a discomfort level of 7 or 8 out of ten is not a bad way to think about it. To grow or improve in any domain of your life or your business, you’ve got to be willing to be a bit uncomfortable. Love to hear your thoughts and experiences. Where have you stepped out of your comfort zone? And where are you resisting being uncomfortable? You can leave your comments below.